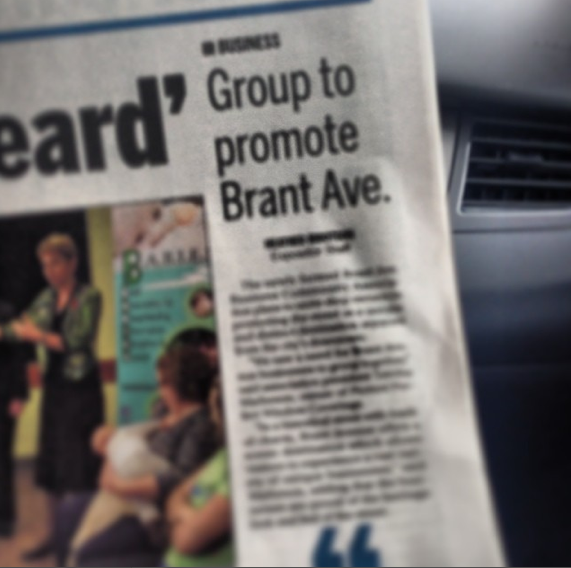 About a month ago I offered my newly developed PR skills to a start up association in the city of Brantford. 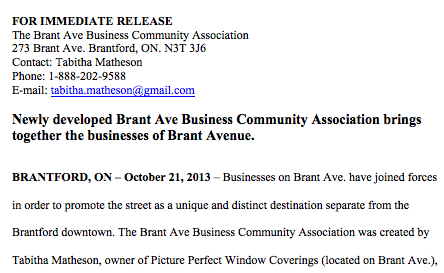 The Brant Ave Business Community Association was established by Tabitha Matheson, owner of Picture Perfect Window Coverings (located on Brant Avenue in Brantford, Ontario). The goal of the association was to unite the businesses on Brant Ave. to promote the street as a unique and distinct destination separate from the Brantford downtown. By pulling together they plan on sharing in advertising costs and the benefit of increased consumer traffic to the neighbourhood. Matheson wanted to get attention from the media, but was unsure of how to go about it. When I volunteered to help her achieve this she was enthusiastic and grateful. 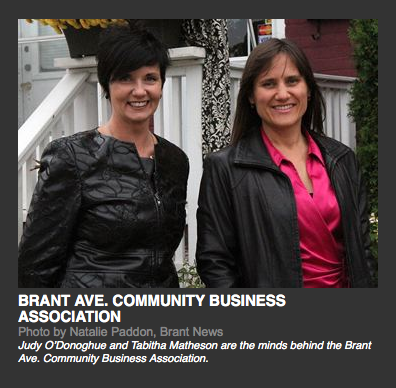 The first step was to visit the businesses on Brant Ave. to ask questions, listen, and take notes on their thoughts about the development of The Brant Ave Business Community Association. The response from partnering businesses on Brant Ave. was fantastic; many said it was about time such an association was formed. 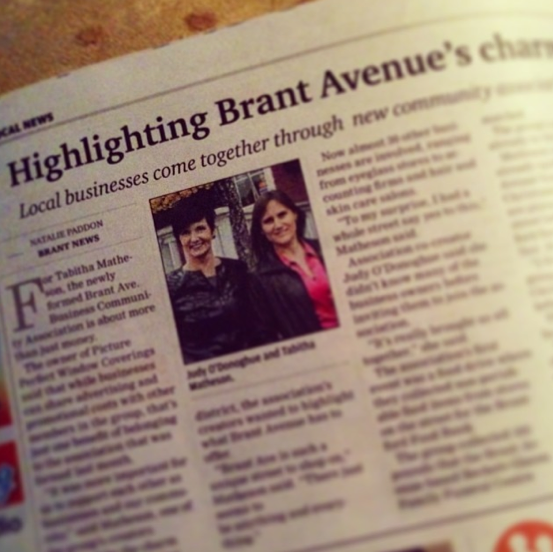 As of now, 30 Brant Avenue businesses have joined. Next I planned of writing and releasing a media release, to announce the creation of the association. Since I started the Public Relations program at Mohawk I had already written two media releases and knew what was required of me. I developed a release and sent it out to the Brantford Expositor, The Brant News, CKPC (jewel) radio station and local Rogers Television on October 29th 2013. I contacted Matheson to let her know where the release was sent and informed her that she should be available and prepared if someone were to contact her or interview her further. 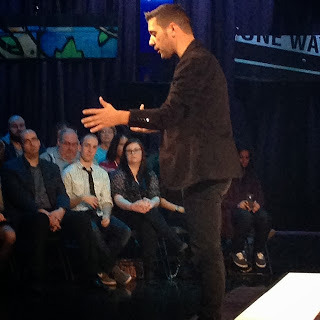 Then things got exciting, the next day while I was on the Mohawk Public Relations field trip to Toronto, waiting to be apart of the audience of George Stroumboulopoulos, Matheson texted me saying that the Brantford Expositor had just called and interviewed her. This was great news; The Expositor had received my media release and wanted to investigate the story further. That evening the article was posted on brantfordexpositor.ca. I was pleased to see that it was positive and very similar to the release I had written. The next day the same article was published in the paper on page A3! I would have been happy to have just received attention from The Expositor, however on October 31st The Brant News also contacted Matheson requesting to do an interview and photo shoot the next day. During the interview Matheson asked the journalists how they heard about the association, they replied that they had received a media release that was forwarded to them by two editors and they stated that the release was very professionally done. This was very exciting for me as my first attempt at distributing media releases was successful. This story was published in The Brant News November 7th. 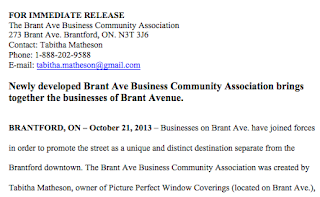 The Brant Ave Business Community Association has plans to host seasonal events with participating businesses to draw visitors from surrounding areas to the street. A seasonal theme of decorations and lights is in the works for Christmas time. I hope to do more volunteer work for the association throughout the year announcing such events.